This space-saving Can Pactor II Recycling Trash Can crushes and stores over 400 cans making recycling aluminum more convenient for you! It perfectly fits into small places and is ideal for home, office or school use. 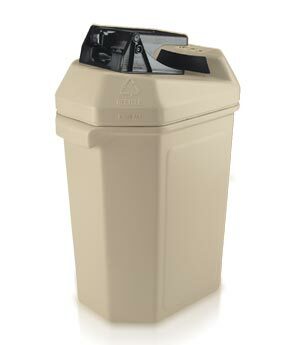 Constructed from extremely durable high-density polyethylene, this recycling receptacle will provide years of dependable recycling service. The lightweight frame can be easily relocated to be used anywhere in your facility. Uses standard 30 Gallon trash bags. Crushes and self-ejects standard aluminum cans. Easy to use, hand-operated crusher allows you to crush cans with ease. Promote recycling at your home, office or school. Uses standard 30 gallon trash bags. Made from long-lasting and extremely durable high-density polyethylene.